Excellent job William!!!! I'm glad I'm inspiring you to push out of your comfort zone and do better work, after all, you'll be looking at your amplifier every time you turn it on. Your finger joints look great. Take your time and block-sand the base from 100-120 all the way up to 380-400 grit. If you don't have an HVLP sprayer like I use, you can still get great results from spraying lacquer from a rattle-can if you sand between coats with 600 grit wet-or-dry paper wrapped around a piece of cork. I look forward to seeing your amp progress. Joints are not that great actually, long range picture. This was my first attempt at box joints, at least in a serious manner. My brother, who owns a cabinet shop doing custom work, gave me a nice set of dado blades when I asked him if he had a set to spare. It turned out he had 4 sets so he gave me a set. It was what I needed to do a half way decent job with box joints. Years ago I did get pretty adept at making dovetail joints quickly but I would need a lot of practice now after 15 or 20 years of doing so. I do not have a HVLP sprayer but naturally I could use my brother's but will probably not make the trip to his house and just use spray cans for a finish. I sprayed custom cars years ago but we only had the wasteful sprayers at that time. I look forward to seeing more of your project. By the way I am building a SET using the GU-50 tubes. I have a Chinese one I built from a kit and it really sounds good. I thought I would build another one but this time using good iron and better parts. Just something for an old man to keep busy doing something constructive. The method that I use for etching is a chemical process that can be considered a reductive acid bath. 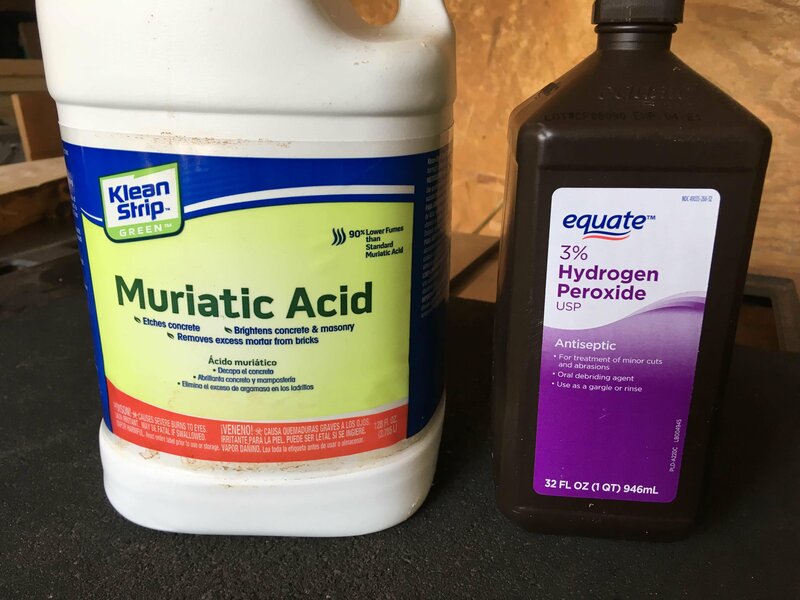 The two chemicals that I use are fairly benign in their unmixed state.... driveway cleaner (Home Depot) and an antiseptic cleanser (Walmart). 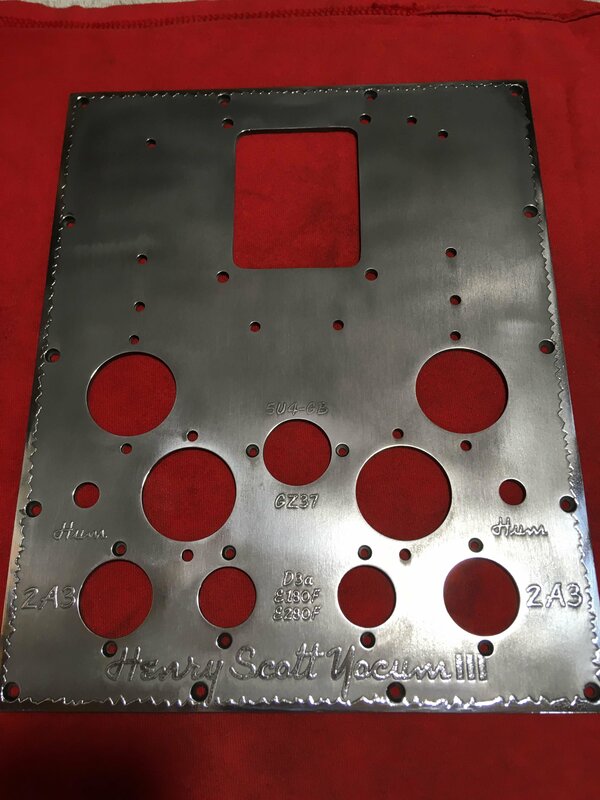 However, when mixed and the Aluminum plate is added, this becomes a very violent combination and should only be done outside. Additionally, as the aluminum gases off I believe it is quite toxic as well, so take the appropriate precautions if attempting to do this. I finish prepping the plates by covering the back of them with packing tape to try to prevent as much erosion of these surfaces as possible (you'll have to re-sand them anyway to assure the proper contact of ground lugs). As this process generates quite a bit of heat, I "float" the bin containing the etchant (and plates) in a larger bin of nearly boiling water. See the pics. NOTE: The ratio of the chemical mixture is approximately 2:1, two parts Hydrogen Peroxide to one part Muriatic Acid. 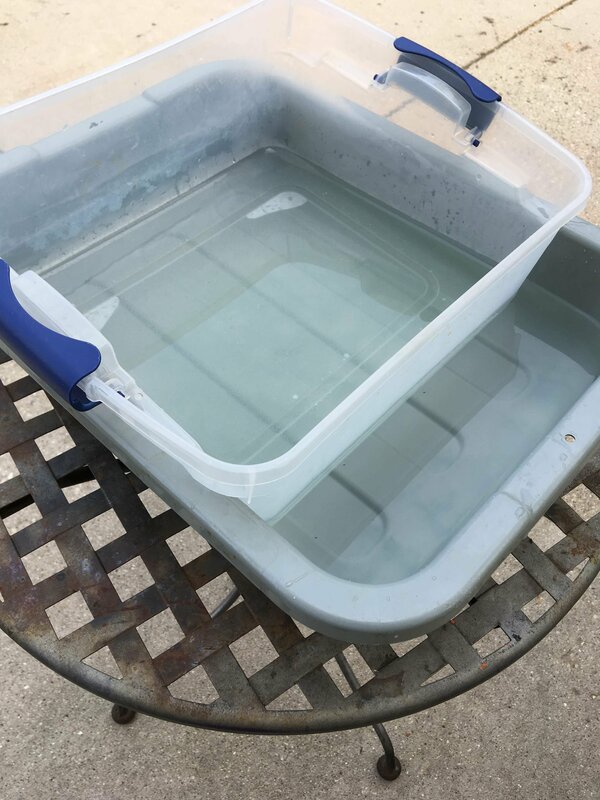 Measure and add the Hydrogen Peroxide to the bin 1st to avoid dangerous splash-backs. 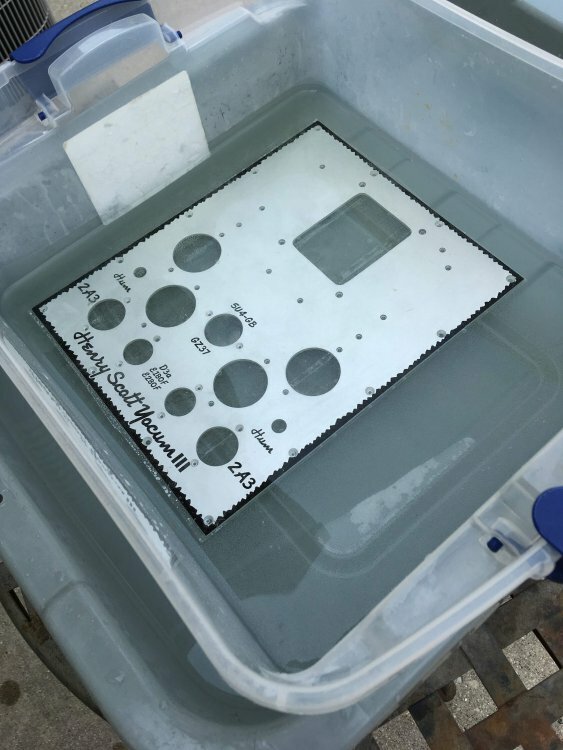 I use a stopwatch to time the immersion of the plates, it is highly critical and varies depending on ambient temperature and humidity. Good luck, it's taken years to get this sorted out, but, I think the results are worthwhile. The 1st pic was taken after dropping the plate into the solution...... the second pic was taken just 60 seconds later. The total time immersed was 210 seconds. 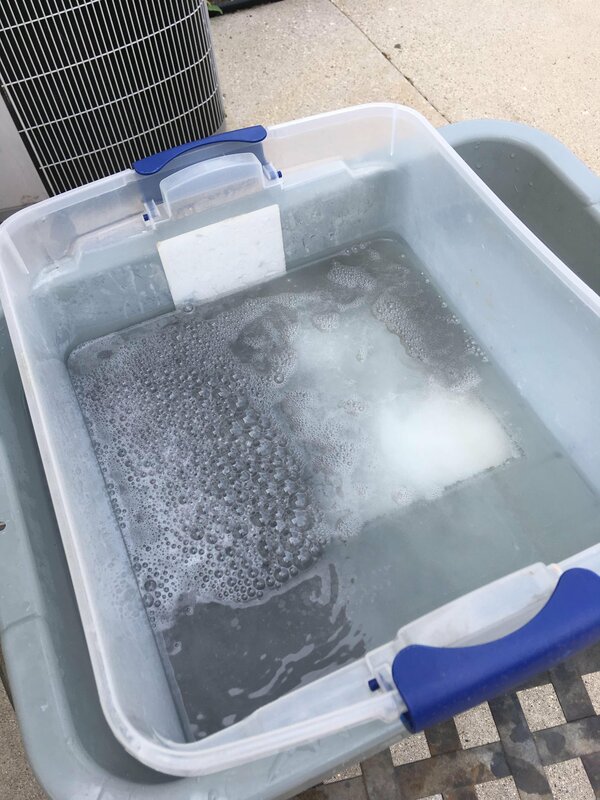 The plate/s are then pulled out of the solution and dropped immediately into the lower tub of water and allowed to rest for about 5 minutes. The plate is then removed from the water and scrubbed with lacquer thinner to remove the baked enamel resist. Having difficulty uploading the pics..... hmm, they don't exceed the 2MB limit. Ahh.... forgot to hit the "plus" buttons on the pics to add them to the post. 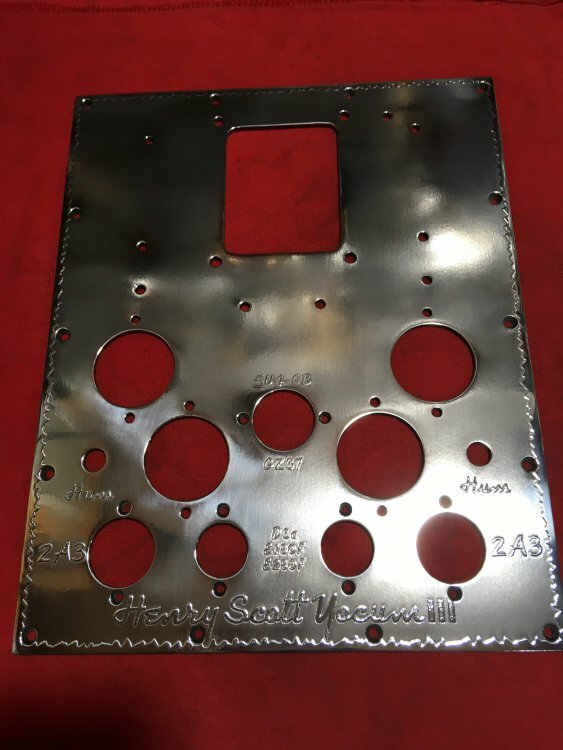 I used to use Ferric Chloride to etch the copper and brass plates (it doesn't work on aluminum), and disposal of the used medium was difficult. I had to wait for the chem. disposal window at the local municipal yard which is only twice a year. Luckily this method doesn't require any unusual disposal method. Listened to one of your amplifiers at the last Hope Pilgrimage and it was very nice sounding. I polish everything on a polishing wheel consisting of a 10" sewn cotton wheel mounted on an old 1750 rpm 3/4 hp electric motor. I exclusively use "RED" polishing compound for the 1st two polishing sessions for each plate, followed by one polishing session using the "WHITE" or Diamond compound....... this takes some time, be patient. The 1st pic is of the top-plate after just the 1st polishing session. 2nd pic is after the 2nd polishing session.... wipe the plate down with an old, old, old cotton t-shirt dipped in fresh lacquer thinner between sessions. There will be a lot of built-up slurry of polishing compound and aluminum that has to be removed between sessions. 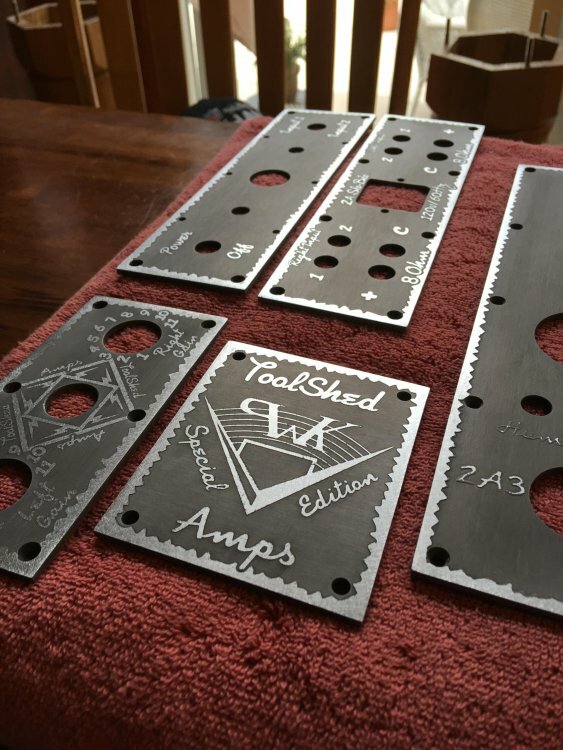 So, as many of you know, the "Memorial" amp is finished and "burning-in" as I type this........ sorry for the delay in posting to this thread. Much of life has gotten in the way. The next couple of installments will be an explanation of how it got to this point, with some detailed photos of my method of wiring/building. As for how it sounds, I'm certain that Scott would have loved it. Impatiently awaiting the next couple installments! +1, can’t but gotta wait for the rest of the story. A bit about power transformers.... my method of cleaning off the poorly applied varnish (usually dipped and allowed to run off) or epoxy is with wire wheels as these do not disturb the varnish that has seeped into the transformer laminations. After cleaning I re-coat the transformer with clear, High-Temp automotive enamel. This coating is designed to protect engine parts and will certainly suffice to protect the power transformer. Here is a pic of Scott's power transformer with parts to assemble it. My preference is for "drop-through" transformers with solder lugs (either Hashimoto, or in this case a custom unit wound for me) as opposed to up-right transformers with flying leads. I then use teflon-jacketed 18-20ga. tin-plated copper wire for all of the power connections. Here it's easy to see the heater wiring with the corresponding "hum" pot, and it's proximity to the power tube socket. I've engineered this amplifier so tightly that there is very little room for error. One more pic for today, this one provides context in terms of what the physical relationship of the parts look like installed on the top-plate. Here you can clearly see the giant Transcendar Choke as well as the vintage Tamura output transformers. Also, you can see the spacers that I used between the hum pots and the top-plate to lower the profile of the trimmers poking through the top. I make these out of the cut-outs from the top-plate itself. Amazing work. Is there any chance at all that this amp will make it to Hope for the spring Pilgrimage so that we can see and hear it in person?